Discover one more cool freebie you are welcome to use for your project launch. This time we propose you a pure layout with eye candy color range. Have a closer look – Free Website Template for Wedding Site is waiting for you! Wedding is a special event with an aura of miracle. It is the celebration of new hopes and steps into new life. Pure and clean this template is associated with the bride’s dress and tender flowers which decorate her hair. Minimal style approach will help you represent the event without drawing attention away from the main heroes of the celebration to bright kitschy details. Wedding album, wedding planner and just a personal page of bridal couple – turn this free website template into a cute website which can share positive emotions and feelings with its visitors. You will find an attractive About Us Page, Gallery for your best photos and the Wishes Page where all friends and relatives can leave their kind words. 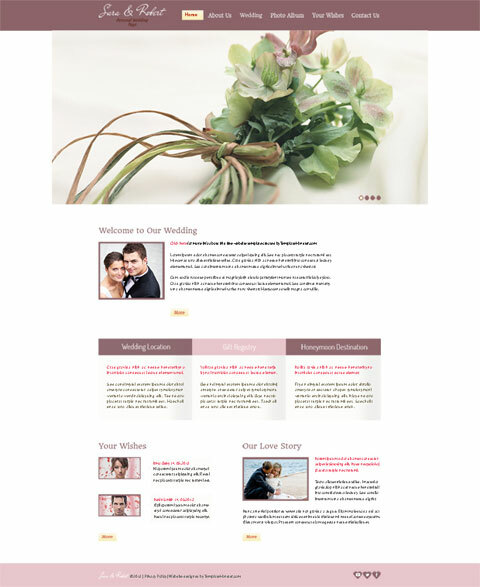 All you need to get this elegant Free Website Template for Wedding Site is just to visit the download page at TemplateMonster and type your email address (don’t forget to uncheck the newsletter subscription checkbox in case you’re already subscribed, otherwise you may not be able to download the zip file). Let this day become the most charming and remarkable one! This entry was posted in Free Website Templates, Free Wedding Templates. Bookmark the permalink.